Searching for the perfect cover-up to compliment a fifties style ensemble? Rather than bunging on your usual jacket over a fantastic swing dress, why not enhance it with this great retro bolero from LA designers Voom? 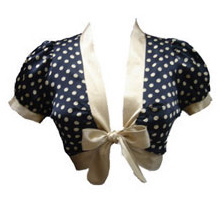 Available at Dollydagger, this polka dot wrap is reversible, made from silk and looks great. Perfect for adding spark to a plain outfit, or providing some cover from the chill come Spring. Available in two colours, this designer piece will set you back £90. Pricey, but it won’t be losing its style any time soon.